Note: McFatty Mondays is no longer!! Instead, I will be posting Momma's Monday Check-in. Join me as I eat and exercise my way through the next 26 weeks. Morning Sickness: I still tire easily and need to eat frequently, but going to bed earlier (9pm) and fixing small meals throughout the day helps a lot. Sleep: Roscoe continues to want to sleep in our bed at night, which means that I'm hyper-alert and not able to get much rest. Work 4 days a week means no naps, either. I can't live without: Long tank tops. I have four cotton maternity tanks from H&M that I love, leftover from my first pregnancy. They are a staple and I wear them almost every day for working out, lounging, and sleeping. Aha Moment: There's not a lot that I NEED for this baby, but a linen Sakura Bloom Sling is at the top of my WANT list. The fabric is gorgeous and this How To video made me dreamy for slinging a snuggly brand new baby. Best moment this week: A stranger noticed my belly, and asked if I was pregnant. Not really the BEST moment this week, but a memorable one! Movement: Still mostly faint, but getting stronger. Gender: The Big Ultrasound is scheduled for November 9th! We're planning Little Sears's Big Reveal party, which will be low key, but fun to organize. Exercise: Another good week. I went to Glow in the Dark kickboxing on Tuesday night (hilarious! ), ran 3 miles on Monday and Thursday, and had a family walk of 3 miles on Sunday. I also lifted weights once. Diet: I'm a little curious about the fact that I haven't gained anything in the past few weeks. I was hoping to gain less this pregnancy than last (which shouldn't be too hard, since I gained 46 pounds!) and so far so good (even though I did gain a lot of it in the final weeks, when water retention was out of control). I've been "eating to hunger, and drinking to thirst" as recommended by my midwife, and not keeping track, which feels good. Goal's for the upcoming week: More running, more kickboxing, and more rest! Maybe a pedicure too. You look great! 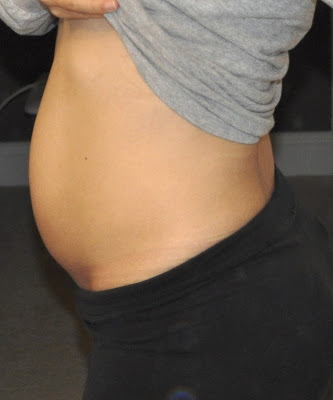 I saw your comment on my post...I notice that my belly is bigger one day and smaller the next, I think its just from gas and bloating. I'm excited to see The Social Network too...but in all honesty, I probably won't until its out on netflix, lol! It still seems crazy that I'm gong to be an Aunty again! It's easier to believe when I see the pictures of your growing belly! You look great!! Love you guys! Ha ha, I haven't thrown a party in forever so I have all these now "old" ideas that I've been dying to try, like a rainbow cake, and tissue paper pom poms. I'm still stewing over the details!